Here we are going to build a simple ECG (electrocardiograph) amplifier circuit. The heart in man and animals produces a small electrical signal that can be recorded through skin surface electrodes and displayed on an oscilloscope or paper strip-chart recorder. This signal is called the electrocardiograph or ECG signal. The peak values of the ECG signal are on the order of one millivolt (1mV). In order to produce a 1 Volt signal to apply to a recorder or oscilloscope, then we need a gain of 1000 mV/1 mV, or 1000. 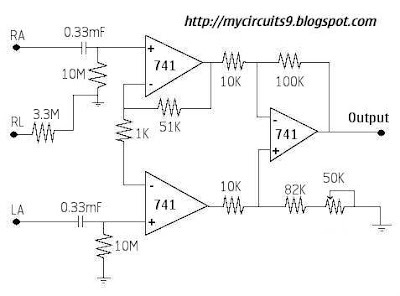 Our ECG amplifier circuit, therefore, must provide a gain of 1000 or more. 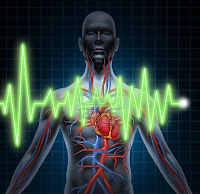 Further more, because skin has a relatively high electrical resistance (1 to 20 Kohms), the ECG amplifier must have a very high input Impedence. Another requirement for the ECG amplifier is that it be an AC amplifier. The reason for this requirement is that metallic electrodes applied to the electrolytic skin produces a halfcell potential. This potential tends to be on the order of 1 to 2 volts, so it is more than 1000 times higher than the signal voltage. By making the amplifier respond only to AC, we eliminate the artifact caused by the DC halfcell potential. Connect the electrode terminal RA,LA and RL to the Right Arm, Left arm, and Right leg respectively. Connect the output terminals to CRO or paper strip-chart recorder. Adjust the 50K Pot, which is wired as CMRR adjust. which op amp is used?